They've made the truck said to turn the world under its tires and the trailer that moves mountains in a day. But what about the hitch powerful enough to connect the two? The CURT Double Lock EZr™ gooseneck hitch boasts easier installation, easier operation and 30,000 lbs. of towing capacity to make towing that oversize gooseneck trailer look easy. 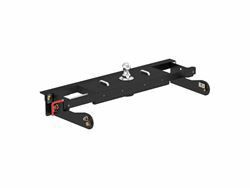 To make things even easier, this gooseneck hitch kit includes both the under-bed gooseneck hitch and the vehicle-specific installation brackets. 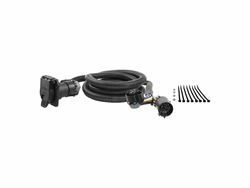 The combined kit makes it simple to get your truck ready for towing by eliminating the need to purchase two different parts. It includes the #60611 gooseneck hitch and the #60624 installation brackets to fit certain years of the Chevy Silverado or GMC Sierra 2500 HD and 3500 HD (for a complete listing of compatibility, see the CURT application guide). Installation of the Double Lock EZr™ requires only one person, using retainer clips to keep bolts secure and the center section fully supported while mounting it into place. It also uses our patented center locator to eliminate meticulous measuring and ensure error-free drilling. The EZr™ also uses carriage bolts whenever possible for one-wrench tightening.